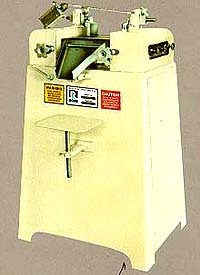 Three Roll Mills are useful for research, development and a variety of laboratory purposes. These rolls are available in three standard sizes: Models 52M 2 1/2 x 5 in., 4 x 8 in. and 5 x 12 in. They are precision ground and are available in steel and stainless steel construction. These rolls are cored and can be supplied with optional rotary pressure joints for heating or cooling purposes.